... while European bourses and US equity futures dipped on a late Sunday report from Bloomberg pouring cold water on US-China trade talks, and according to which the two sides have so far made "little progress" on the issue any deal Trump strikes with China may ultimately be judged on: ending what the U.S. has dubbed as decades of state-coordinated Chinese theft of American intellectual property. BBG added that this stood in contrast to movement on other fronts that has lifted stocks in recent sessions, including a report on Friday that China offered a highly unrealistic path to reducing its trade surplus to zero by 2024. As a result, emerging-market currencies weakened and stocks erased gains as traders assessed potential roadblocks in U.S.-China trade talks later this month. The yuan weakened as the U.S. and China negotiators were said to remain far apart over the key issue of intellectual property, with the next round of talks scheduled for Jan. 30-31, even as the Shanghai Composite rose 0.6% to close above 2,600, while the Nikkei was fractionally in the green, rising 0.3% to 20,719 and Australia was also green. Chinese optimism did not carry over to Europe, however, where the Stoxx 600 index was on course for its first drop in five days, tracking S&P 500 futures lower in muted volumes due to the MLK market closure in the US. 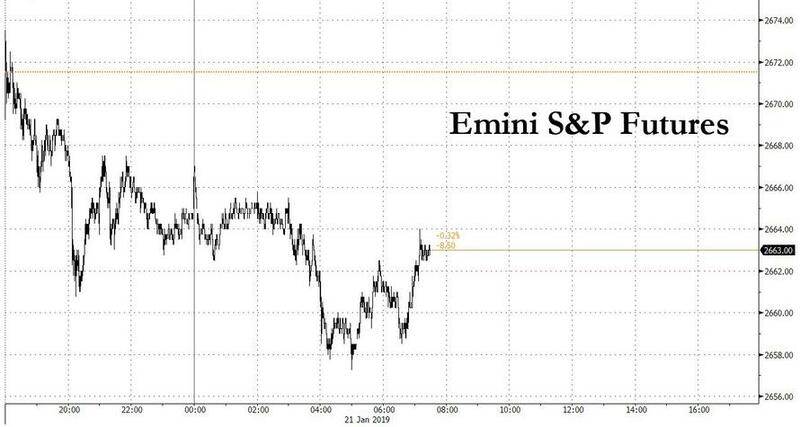 That said, European stocks trimmed early losses, with Stoxx 600 hitting session high, still down 0.2%, with telecom, utilities and banks shares leading declines, while airlines rallied. European telecom companies were the first sector to give up 2019 gains, with the Stoxx 600 Telecommunications Index falling as much as 1.5%, making it Monday’s biggest sector decliner in Europe and erasing this year’s gains after slightly negative reports on several large carriers. The sector is now down 0.6% on the year, the first industry group (but certainly not the last) in negative territory for the period, with Deutsche Telekom leading declines with a 2.4% drop after a Berenberg downgrade; Orange, Vodafone, and Telecom Italia all dropped as well. Earlier in the session, Germany report that PPI rose 2.7% Y/Y in Dec, missing expectations of 2.9% and far below November's 3.3% print as Europe's inflationary impulse appears to be fading. S&P 500 futures dropped as much as 0.5% and hit a session low around 5 am, although they have since posted a modest rebound and were down 8.5 points last. Monday's muted start was in stark contrast to last week's rally, when risk assets extended gains amid positive manufacturing numbers and signs the U.S. and China were closing in on a trade truce (even though many of these were officially denied). 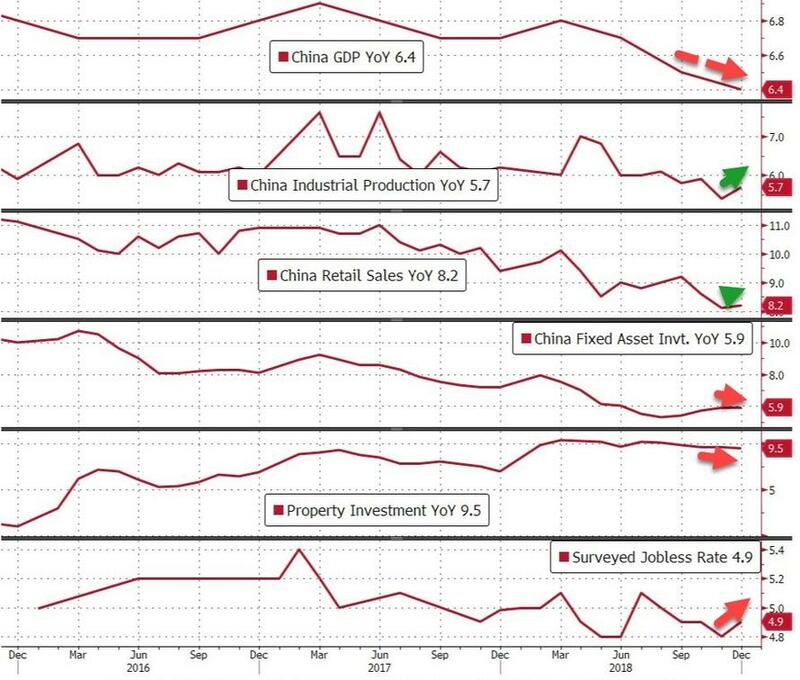 However, as Bloomberg notes, the "picture is complex", as reports on intellectual property paint a less optimistic view on the outlook for talks, while data on Monday confirmed China’s economy expanded at the slowest pace since the global financial crisis. In FX, the pound erased a loss before Theresa May returns to Parliament to explain what she’s going to do next on Brexit. On Sunday, the U.K. prime minister ditched cross-party talks and was set to try to get her failed deal through Parliament with votes of Conservatives and her Northern Irish allies. Elsewhere, the dollar was steady, while bonds in Europe were mixed. The yen rose versus all its G-10 peers as global risks, including a lack of progress on the key U.S.-China trade issue of intellectual property, underpinned demand while Treasuries didn’t trade due to the MLK holiday. Asian equity markets began the week higher as the region followed suit to the optimism seen last Friday amongst the US majors after reports China is to offer concessions to eliminate the US trade imbalance, but with gains capped as participants digested a slew of Chinese data including 2018 GDP which was at the slowest growth in 28 years as expected. ASX 200 (+0.2%) and Nikkei 225 (+0.2%) were both positive from the open as they benefitted from the US-China trade optimism, but then pulled-back from their highs heading into the Chinese data and after US Trade Representative Lighthizer noted there was little progress made with China regarding intellectual property theft. Elsewhere, Hang Seng (+0.4%) and Shanghai Comp. (+0.4%) had a relatively tepid open on caution prior to the key data releases and after the PBoC skipped liquidity operations, although Chinese markets later breathed a sigh of relief from the inline GDP numbers, as well as better than expected Industrial Production and Retail Sales data.